There were unfortunenately clouds outside my kitchen window in Älghult, Småland, Sweden It took a while until I discovered the eclipsed moon appearing from behind a tall tree. I succeeded to set up my Canon 50D with tele, Hähnel Giga Giga T Pro remote control. At that time it was 11:30pm and the eclipse was not total anymore. As I could not get both Mars and the Moon in one view with my tele, I decided to make a photo with Gimp where I added the moon taken with tele to the photo above. 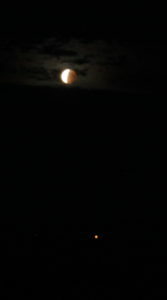 The photo below that I got, gives an idea how I saw the Moon and Mars from my windows.